1 Gloucester is located on the SE corner of Beacon and Gloucester, with 397 Beacon to the east, 401 Beacon to the west, across Gloucester, 400 Beacon to the north, across Beacon, and 3 Gloucester to the south, across Alley 416. 1 Gloucester (399 Beacon) was designed by architect William G. Preston, one of two houses (397 Beacon and 1 Gloucester) built ca. 1870. 1 Gloucester was built as the home of Charles Edward Cook and Elizabeth (Wells) Cook, and 397 Beacon was built for their son, Charles Wells Cook, for speculative sale. Charles Wells Cook was unmarried and lived with his parents at 1 Gloucester. Charles and Elizabeth Cook previously had lived at the United States Hotel, and Charles Wells Cook had lived at the Norfolk House hotel. Charles Edward Cook purchased the land for 1 Gloucester on February 10, 1869, and his son purchased the land for 397 Beacon on the same day, in both cases from a real estate investment trust formed by John Templeman Coolidge, Franklin Evans, and Charles Henry Parker. The land was part of a parcel purchased by the trust from the Boston Water Power Company on January 29, 1866. It subsequently had subdivided the property into lots, which it sold to investors and builders, who then frequently resold the lots to others. The two lots purchased by the Cooks originally had been sold to dry goods merchant Eben Dyer Jordan, co-founder of the firm of Jordan, Marsh & Co. He never took title to the property and released his right to purchase it to the Cooks. Click here for an index to the deeds for 1 Gloucester. Charles Cook was a dealer in paper hangings (wall paper). He served as a member of the Boston City Council and as President of the Massachusetts State Senate. Charles Cook died in September of 1874. Elizabeth Cook and Charles Wells Cook continued to live at 1 Gloucester until about 1876. The house was not listed in the 1876-1879 Blue Books. On May 21, 1879, 1 Gloucester was purchased from Elizabeth Cook and Charles Wells Cook by attorney Joshua Bennett Holden. He and his wife, Ida L. (Moulton) Holden, made it their home. They previously had lived at 11 Berwick Park. The Holdens continued to live at 1 Gloucester during the 1881-1882 winter season, but were living elsewhere thereafter for several years. During the 1882-1883 winter season, it was the home of Alfred Ennis and his wife, Almarinda (Baldridge) Ennis. He was a lawyer in Topeka, Kansas, in Boston on protracted business. He later would become general counsel of the Pullman Palace Car Company in Chicago, and later still a justice of the Indiana Supreme Court. By the 1883-1884 winter season, 1 Gloucester was the Boston home of Elisha Slade Converse and his wife, Mary Diana (Edmands) Converse. They also maintained a home in Malden. Elisha Converse was treasurer of the Boston Rubber Shoe Company and president of the First National Bank of Malden. He was Malden’s first mayor and had served in the Massachusetts legislature in the early 1880s. They continued to live at 1 Gloucester during the 1884-1885 winter season, but moved thereafter to the Hotel Vendome. By the 1887-1888 winter season, they were living at 348 Beacon. During the 1885-1886 winter season, 1 Gloucester was the home of Frederick Daniel Hussey and his wife, Mary (Winston) Hussey. 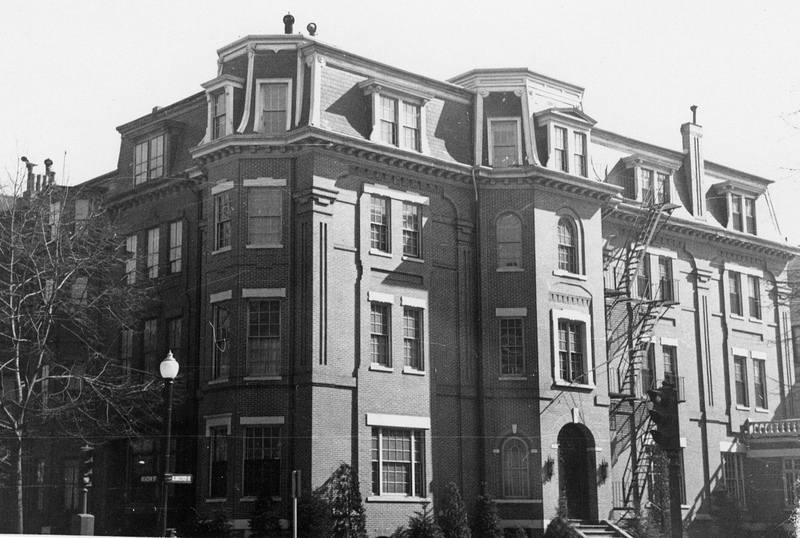 They previously had lived at the Hotel Brunswick (southeast corner of Clarendon and Boylston). By the 1886-1887 season, they had moved to 333 Beacon. 1 Gloucester was not listed in the 1887 Blue Book. By the 1887-1888 winter season, the Holdens were once again living at 1 Gloucester. As originally built, the Gloucester Street façade was symmetrical, with the entrance located in the bay at the center, flanked by equal sized wings. Between 1890 and 1895, an addition was built on the south side, extending the house to the alley and projecting to the sidewalk at the basement and first story levels. 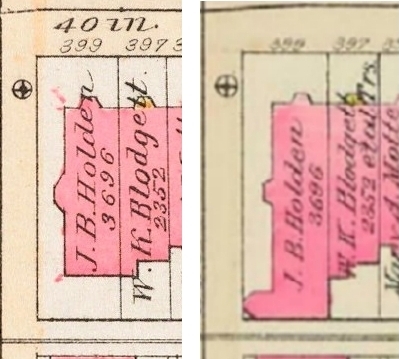 The addition appears on the 1895 Bromley map, but is not shown on 1890 map. The Holdens continued to live at 1 Gloucester during the 1902-1903 winter season, but then moved to the Hotel Somerset, where they were living at the time of his death in June of 1910. They continued to own 1 Gloucester and lease it to others. During the 1903-1904 winter season, 1 Gloucester was the home of wholesale shoe and boot merchant William Leander McKee and his wife, Bessie (Pardee) van Wickle McKee. They had lived at 115 Bay State Road during the previous season, and at 316 Beacon before that. Bessie McKee was the widow of Augustus Stout van Wickle, a Pennsylvania coal operator and bank president. Her daughters from her first marriage, Marjorie Randolph van Wickle and Augustine van Wickle, lived with the McKees. The McKees maintained a home, Blithewold, in Bristol, Rhode Island, which had been built in 1896 by Bessie McKee’s first husband. In December of 1904, the McKees purchased and subsequently moved to 284 Commonwealth. 1 Gloucester was not listed in the 1906 and 1907 Blue Books. During at least part of the 1906-1907 winter season, 1 Gloucester was the home of Frederic Jesup Stimson and his wife, Mabel (Ashhurst) Stimson. 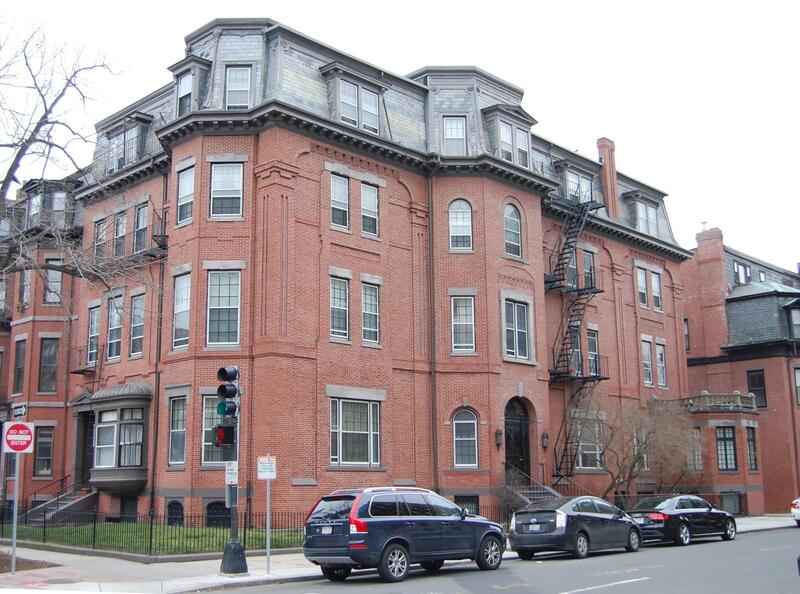 Their primary residence was in Dedham and they were not listed at 1 Gloucester in the 1907 Blue Book; however, a January 17, 1907, Boston Globe article indicated that they were living at 1 Gloucester when Frederic Stimson reported the loss or theft of a pearl necklace valued at $1,800. During the 1907-1908 winter season, 1 Gloucester was the home of architect Edmund March Wheelwright and his wife, Elizabeth (Brooks) Wheelwright. They previously had lived at 59 Bay State Road. In May of 1908, they purchased and subsequently moved at 133 Beacon. 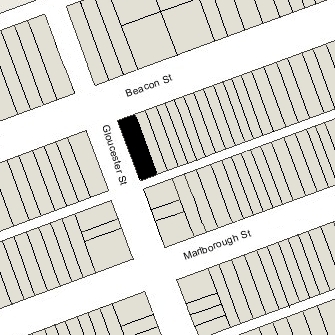 1 Gloucester was not listed in the 1909-1917 Blue Books. On November 29, 1916, 1 Gloucester was purchased from Ida Holden by Marion McBurney (Schlesinger) Whiting, the wife of Jasper Whiting. They lived at 17 Exeter. He was a chemical engineer and inventor. Among his inventions were a process for making Portland cement from blast furnace slag and the “Whiting Cell” used in the manufacture of chlorine gas. On March 26, 1917, 1 Gloucester was purchased from Marion Whiting by Martha (Fuller) Halsey, the wife of Oscar Lawrence Halsey. They also maintained a home at Little Boar’s Head in New Hampshire. The Halseys had lived in St. Louis in 1915, where he was a Packard automobile dealer. He sold his dealership and moved to Boston, where his brother-in-law, Alvan T. Fuller, also was a Packard dealer (and would become Massachusetts Governor in the 1920s). In Boston, Oscar Halsey continued as an automobile dealer, representing the Chalmers and later the Wills St. Claire automobiles. Martha Halsey’s mother, Flora Anabella (Tufts) Fuller, the widow of Alvan Bond Fuller, lived with them at 1 Gloucester. The Halseys divorced in the late 1920s and he subsequently moved to Beverly Hills, California, and remarried. Martha Halsey and their daughter, Hope, continued to live at 1 Gloucester. Flora Fuller continued to live with them until her death in January of 1934. After Mrs. Fuller’s death, it appears that the Martha Halsey and her daughter lived at 1 Gloucester only during the winter seasons, if then. Martha Halsey was listed in the Blue Books through 1937, but the house was shown as vacant in the 1935-1940 City Directories. By 1940, they were living in an apartment at 282 Beacon. On November 27, 1939, 1 Gloucester was acquired from Martha Halsey by real estate dealer Henry Joseph O’Meara, and on December 15, 1939, it was acquired from him by David A. Finkelstein. He and his wife, Hilda (Jacobson) Finkelstein, lived in Dorchester and later in Brookline and then in Newton. David Finkelstein was president and treasurer of a linen supply company, and later would become a real estate dealer. In the mid-1940s, he changed his name to David Finn. In May of 1940, he applied for (and subsequently received) permission to convert the property into ten apartments. On October 13, 1942, he transferred 1 Gloucester to his wife as trustee for their two children, Robert and Judith. David and Hilda Finn were killed in May of 1956 in an automobile accident in New Hampshire. The property changed hands and in May of 1971 was purchased by real estate broker and investor George Demeter. He also owned 397 Beacon, which he had acquired in 1965. In February of 1996, he transferred 1 Gloucester to the Pierce Limited Partnership (of which he was the president). At the same time, he also transferred 397 Beacon and 350 Beacon to the same limited partnership. 1 Gloucester remained an apartment house in 2017.